I’ve been making a prototype this week for exhibition in a ‘work in progress’ exhibition and thinking about the moral dimensions of material engagement with research artefacts from a few different angles. My intention has been to integrate the physical social network tiles with the videos I made of participants talking about them. So the idea is that the physical network, and the story of the network are presented in a single experience through an integrated object. 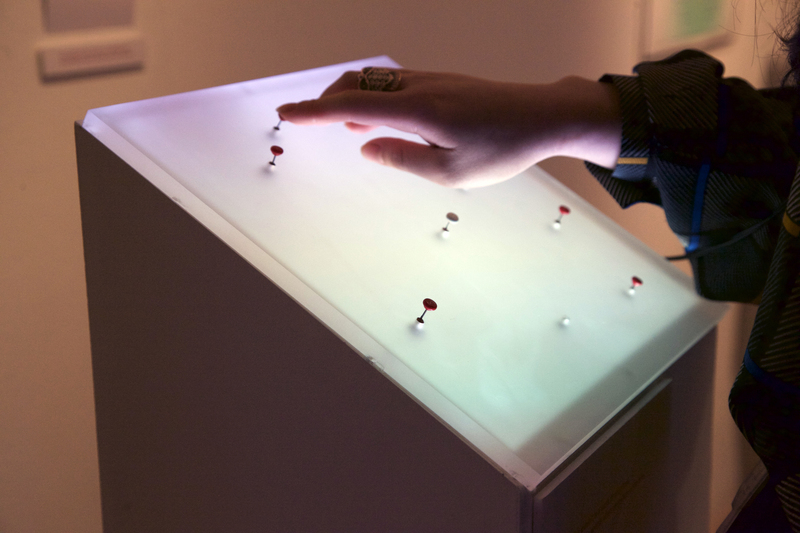 By back projecting the video onto a network tile whose nodes are physical buttons that play the various videos, I hoped to make a direct connection between network nodes and network stories. I set out to make a completely new object since my feeling was that adapting, transforming or otherwise changing the original network representation created by a research participant would be ethically unacceptable. My research centres around the use of design as mediative – that is design is used to elicit responses from various interested people – the end result is all their work, often intimate and personal, usually revealing of personal relationships at varying degrees of fidelity. Even though the network tiles were returned to me for safe keeping and analysis, research ethics would imply participant responses should be treated as original works in themselves, my role in configuring the materials into a relevant form notwithstanding. One way through this dilemma would be either to ask for further consent to intervene in people’s completed representations or to involve them in the making of the final piece. Creating and presenting representations of what participants do in co-creation settings is seen as ethically problematic. James Clifford makes the point that once participants start to be seen as co-authors with researcher as ‘interpreting observer’ a hierarchically organised representation must be the result. Gibson-Graham says design representations are have a performative function – they allow the researcher to perform both the role of author and the role of expert creator and analyst. The ethical requirement is that the design researcher takes account of these textured relations. The politics of representation, so well covered in art and design schools in the undergraduate lessons on semiotics, come into play here. What set of social relations are embodied by the representations we construct? How accurately do they reflect the situations of their original making? What new set of institutional or artefactual relations are set in motion by the representation? Simonsen and Robertson suggest it is necessary for the design researcher working with people to take account of all these factors when making representations of what participants have done. I would of course agree with that but not to the extent of precluding the making of expressive representations at all. Rogers has written about the chokehold ethical concerns imposed from different areas (eg medicine) can have on design research, with designers avoiding investigation into some areas i.e. assistive technology, due to rigid ethical requirements devised in a pre-technological era. One weakness of the ethical arguments in the participatory design literature is that they all assume a similar dynamic. The doing of participatory design is considered to be aligned towards work and to be oriented towards the development of technologies that improve working life in some way. Since what I am doing is examining the role design in the externalisation of digital experiences, much of the literature seems misdirected. For example there are clear ethical concerns about inclusivity when designing say, an app for children in a hospital. This focus on goal-directed outcomes is perhaps a reflection of the roots of participatory design in the union-driven movement of 1970s scandinavia. Problematic methods shown by Star and Strauss in this context include the creation of non existent characters such as personas, decontextualising the representations by exploring scenarios, and abstracting indicators. The problem here is how to generalise towards a design that might fulfill wider needs than simply those captured from participants. My research is not about providing a design appropriate to the carrying out of a particular task, nor is it confined to workplace requirements. Instead, my focus is the development of a series of tools useful for thinking about digital experience. To that end the research is deeply moral and political in that its purpose is to provide an experiential window into otherwise inaccessible or opaque knowledge. I am doing this not by explaining, describing, or recounting but by designing a set of circumstances – institutional, environmental, and material – conducive to reflection targeted in a certain direction. A final ethical concern related to working with participant data is how it is analysed. It is morally acceptable to impose a set of criteria and categories on the data that may not be there? Researchers have to reach some kind of theoretically or statistically generalisable conclusions, particularly if they wish to achieve a PhD! This involves normalising the contingent behaviour apparent in participant responses. It’s clear that the resulting representations can have the same effect. If the design I create flattens clearly expressed priorities, or overlooks others in pursuit of clarity or creativity then the result is a misrepresentation. Star and Bowker address this problem with the idea of the ‘residual category’, meaning everything left over when the data has been organised. ‘None of the above’ or ‘not otherwise specified’ may be the places where the richest description is found. Designers should, they suggest, examine this material more carefully. As I continue to develop what will be a series of designs; some representative constructions of the research process, and others more speculative, these ethical concerns will inform my notions of reflective practice and my own role in shaping the research.